Sevres Porcelain – The company history, its products, its double L mark and the main periods. At that time the brothers Dubois, who were arcanists that fled from Chantilly, had already experimented to produce porcelain at the Chateau de Vincennes. Together with Gravant, they succeeded in producing a type of soft paste frit-porcelain around 1745. The Sevres Porcelain Factory was originally founded in 1738 at Chateau de Vincennes, France by local craftsmen from a nearby porcelain factory at Chantilly. From the beginning, Sevres created finely detailed gilded and hand painted decorative arts for the wealthy and privileged. After the death of the Marquis in 1751, it was king Louis XV himself who took a 25% interest in the company and allowed it to change its name to “Manufacture Royale de la porcelaine de France” and also to use the double L monogram as a factory mark. Louis XV took over the entire Sevres porcelain operation himself around 1759, believing himself the best ambassador to promote its wares to both a French and increasingly internationale clientele. The Vincennes factory was also granted the monopoly for polychrome painting on porcelain. The other French factories were only permitted to paint their porcelain in one colour. This monopoly stood until 1780. In 1756, the factory was moved to Sevres, where it is still in operation. Due to the low firing temperature required to produce frit-porcelain, it was possible to apply a rich palette of colours for decoration and this became an example which would be followed by a lot of other European porcelain factories. Sevres also set an example in modelling unglazed biscuit porcelain, which was introduced by Bachelier. 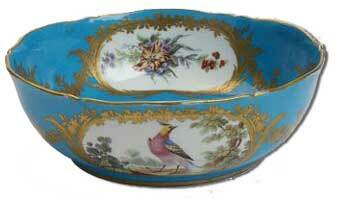 In 1772, after the discovery of a deposit of kaolin at Limoges, Sèvres began to produce hard paste porcelain. 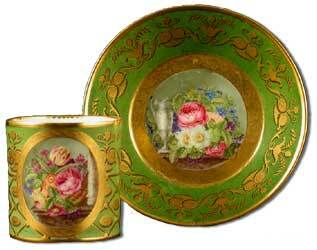 In 1804, after the factory was given the title “Manufacture Imperiale”, frit-porcelain production ceased. But, everything changed with the coming of the French Revolution and the depression which followed. The Sevres company was in financial ruin, its aspiration to challenge the German company Meissen as the most desired porcelain for the royal and wealthy was in tatters. The company was forced to try to survive with a greatly reduced work force and shortages of cash and raw materials. The government appointed a new administrator Alexander Brongniart to the Sevres operations at the turn of the century. Brongniart was a scientist and son of an architect but a man with little or no experience in porcelain manufacturing or design. He was however skilled in chemistry, botany, zoology, and geology, a true Renaissance man. Brongniart applied his skills and experience to the manufacture of porcelain in ways never used before. Creative design and production efficiencies flourished, and the factory began to recover from the hard times. Sevres Porcelain then began to shed its dependence on the French Royal family by expanding to produce highly crafted pieces for the wealthy and simple yet high quality pieces for a broader section of society. The factory also invested in glaze and kaolin (the raw material of porcelain) experimentation as well as the expansion of the decorating department. Reflecting the renewed fire of their ambitions, Sevres created one of the world’s first museum’s devoted exclusively to porcelain and included in it exhibits and antiques from around the world as well as from their own production. Sevres Porcelain continued to thrive through a succession of French rulers including Napoleon. Napoleon preferred grand pieces of the Empire style, with classical influences but elaborate ornamentation signifying power. Sevres retained Royal preference and influence throughout the 19th century even as various style preferences came and went. Their production changed in utility as well, adapting to the needs of society for new presentation dishes and containers for new cuisine and food & drink preferences. Well known artists such as Fragonard worked at Sevres, and their focus on premium production and pricing enabled them to attract only the best decorators. Throughout it’s long years it has reinforced and advanced the French reputation for producing some of the worlds highest quality luxury goods for the wealthy and privileged. The Wallace Collection holds the finest museum collection of Sevres Porcelain in the world. Other great collections include the Royal Collection at Buckingham Palace & Windsor Castle, and the Rothschild Collection at Waddeson Manor. Both Sevres Porcelain collections came together in the nineteenth century as a result of the French Revolution when many works of art came on the market. 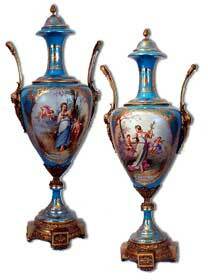 Collecting Sevres Porcelain, if you can afford it, is probably one of the best collecting investments you could make.